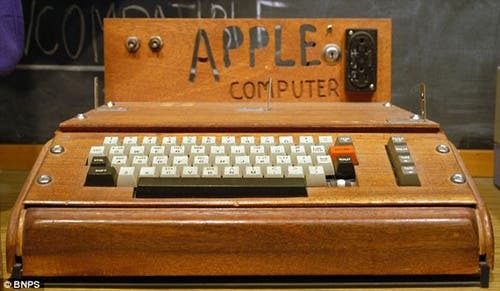 In 1976 Steve Jobs sold his first batch of 200 Apple-1 computers for the bizarre price of $666.66. The one shown here is now going for $240,000 at auction. That first machine—hand-carved, packing a terrifying 8K memory -the first fully pre-assembled computer produced, complete with a 1.0 MHz MOS 6502 processor and an extra cassette interface for read/write capability. It was, essentially, a glorified calculator. was a major milestone in technological history. 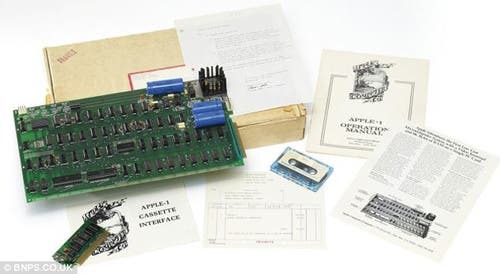 This vintage Apple-1 comes in its original packaging, complete with instruction manual and a letter signed by Jobs himself.